Enjoying a wonderful location in the heart of the resort the Shipka has always been a firm favourite with Balkan holidaymakers. The hotel is divided into 3 star and 4 star accommodation, it has an excellent range of facilities and a popular Health and Fitness club. Third time at this hotel. It is still a good hotel although this year we had a few minor problems we got stuck in lift twice and had to be rescued and then the third time it broke down and had to climb 6 flights of stairs to get to our room. The receptionists this year were not very helpful, or friendly. Also they still don't give you the breakfast pack before you leave in the early hours of the morning. Breakfast this year was hit or a miss as at times, there was hardly any choice even when we went down early every morning. There was no one to help with the luggage, the cleaners were very good and always clean towels and bedding. Returned from Golden Sands 2 weeks ago and stayed in the Shipka. We paid to stay on the 3* side of the hotel, this is the side of "party street". If you like an early night (before 12.30) don't expect it to be quiet! 4* is at the rear of hotel and is the quiet side. Hotel is not far from red light area but don't have any complaints. Did not see any prostitutes in or in surrounding area of hotel. Right next to party street so ideal for falling in drunk! But too close for any one who isn't a night owl. We were originally placed on first floor on the front and heard people walking past drunk, coming in drunk all through night, but one word with balkan rep and she had our room switched. Ended up on 10th floor which had fantastic view of sea! Only down side is that lift broke down a few times so 11 flights of stairs kept me fit (apparently if you got stuck inside the lift, the odd kick got it working again). Some staff were lovely and friendly, others were miserable! Hotel Shipka Golden Sands. This hotel was very clean an added extra was the displays the chambermaids left everyday with our towels. The 2 pools were extremely clean the indoor one having a jaccuzi. The staff were friendly and answered all our enquiries. There was a very nice seating/bar area where we could relax watch tv or play cards there was the odd prostitute passing through but they never bothered us just said hello. It would have been nice to have some sort of entertainment in the hotel but plenty to find on the street outside. About 5 mins to the beach. Would definately use this Hotel again. Loved Bulgaria just not this hotel the pool area was great good location for the beach . The prostitutes were the problem if you have children I wouldn't recommend it. The "ladies " use the hotel for their business. Also lots of German men there for the obvious thing!!!!!!!!!!!!! 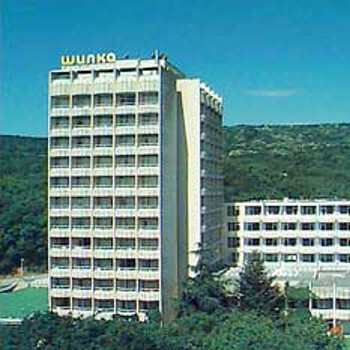 Not a family hotel will be a lot more careful when we book this time as Balkan weren't interested when we complained. Stayed at this hotel for a second time and have to say on arrival we were made to feel like old friends returning with a warm welcome from the concierge and reception staff who immediately recognised us from the year before (september 2003). Got put on the 10th floor fantastic views of the sea and poolside areas and the rooms were as high a standard as you would expect back home (in some cases I would say higher than at home). Firstly there is a high contingent of Germans that use this hotel but that is not a bad thing as germans do not like to be treated as second class and if anything ever goes wrong in a hotel they will report it immediately. They are loud when they sing their drinking songs and it will get on your nerves if you don't see the funny side of life. However learn a few key phrases, learn the odd german song (logo logo) and you will soon be talking about Berti Vogts failure to get the Scotland team performing and how Paul Lambert was sensational in Germany. The hotel serves potent and I mean potent cocktails so take it easy but their cocktail bar has got a few Tom Cruise style tricks to keep you entertained when pouring some drinks. Pools are kept clean daily (indoor and out), bedding changed regularly, clean towels everyday. Good value but I would agree it is a hotel suited for couples and adults as it is near the red light area. Never had any bother and all the staff are helpful even if their faces don't always show it.